As the pressures of globalization are crushing local traditions, millions of uprooted people are buying into a new American salvation product. This fundamentalist Christianity, a fusion of American popular religion and politics, is one of the most significant cultural influences exported from the United States. 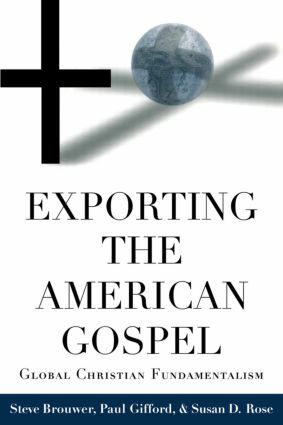 With illuminating case studies based on extensive field research, Exporting the American Gospel demonstrates how Christian fundamentalism has taken hold in many nations in Africa, Latin America and Asia. Susan Rose is Associate Professor of Sociology at Dickinson College; Paul Gifford is Professor of the Study of Religions at the School of Oriental and African Studies at the University of London; and Steve Brouwer is author of Conquest and Capitalism.